A living legend and the legend who lives on, are having their birthdays today. One of the 'Mellisai Mannargal', M.S.Viswanathan popularly known as MSV and 'Kaviarasu' Kannadasan share their date of births today. Looks like they were destined to be together right from birth. 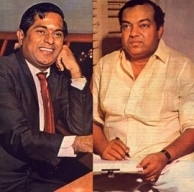 Both the legends have immensely contributed to the film fraternity with many timeless songs, still lingering among us. MSV with more than 1100 films to his credit majorly collaborated with Kannadasan, garnering huge success. Starting with his 86th birthday today, we wish the evergreen 'Mellisai Mannar' a long, healthy life. Every other song of him emotionally etched in us, 'Kaviarasu' Kannadasan is remembered today. It is indeed a great day for Tamil film music. People looking for online information on Kannadasan, Kannadasan birthday, M S Viswanathan birthday, MSV will find this news story useful.